I’ve never become a huge Bob Dylan fan. Like Springsteen, Bowie and Leonard Cohen I’ve listened enough to admire him, and grew to love one or two albums but that kind of obsessive devotion that he inspires hasn’t gripped. I’m hung up on plenty of musicians that won’t ever get anywhere near the exalted status of the legendary names above. Maybe that’s a worry. No matter. 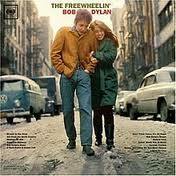 The Freewheelin’ Bob Dylan is the Bob album that I’d unhesitatingly list as my favourite. My copy was rescued from the £1 basement of Record and Tape Exchange on Camden High Street when it was on the other side of the road from its current location. That shopfront, which must have sold so many albums to so many people of different nationalities might be the Pret now, or may be another dismal clothes shop. I brought it on the same day as a rather natty Levi’s corduroy jacket. Dark blue. When I got home with both my Dad, possessed by Sixties nostalgia put the album on. More disturbingly, he put the jacket on too. The vinyl, which is almost 50 years old, plays beautifully and without a scratch. The cover shows Dylan and a young lady (were I a Dylan nut I’d know who she was, but I don’t) hunching while walking, smiling, down a wintry New York street. It’s a lovely picture, romantic and youthful. The song is a fond looking back at the easy camaraderie and idealism of the young when they are young. The is also in the Dream a wry but sad requiem for the friendships that have evaporated as different routes, geographical and otherwise, are taken. You can probably still find copies for a quid all over the place. That’s not much for a lovely album.